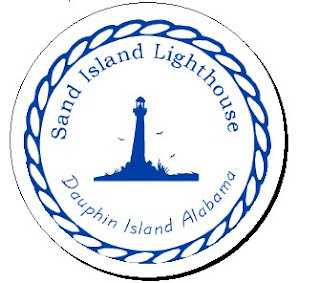 Lighthouse's of Alabama News: Lighthouse official stamped seal now available. Lighthouse official stamped seal now available. A Sand Island Lighthouse passport stamp has been designed and is now available to the public. The stamp was presented to the Town of Dauphin Island Sunday Dec, 7 2008 at the Isle Dauphin Club on Dauphin Island. Town Council member Mary Thompson accepted the self inking seal on behalf of the Town of Dauphin Island. The stamp was a gift from the Warren Lee to the Town of Dauphin Island. Lighthouse stamp collecting is a great hobby and Sand Island lighthouse is way overdue for one. Warren Lee made the presentation. To obtain a stamping of the Sand Island Lighthouse Official stamp a person should visit Dauphin island Town hall and confirm that they have seen the lighthouse. The clerk will then be happy to stamp their passports.